I didn't really end up spending much time in Dunedin this weekend. After arriving back from Rotorua late on Thursday night, I was leaving again by early Saturday Morning. Our plan to put our creekboats into use. Both Robin & I had been out of creek boats for months. (Well I hadn't been in mine since at least January!) Too much time in the little boat. We drove straight to Central Otago with a predicted front bringing rain late on Saturday Night. For some reason we decided to head straight to Nevis Bluff to take a look, consensus it was big! Sitting at about 260 cumecs it was an entirely different rapid than when we've both run it at around 150. Huge waves and really big holes. We portaged down river left and put in below the the two top drops. Paddling the 2nd half was a quick re-introduction to being extra bouyant in a creek boat. I felt like I was being pushed around like a 3rd former in a rumble-line down the corridor. I soon readjusted to the creek boat and we paddled down to Citreon, after some scouting we both opted for the right line around the Citreon Rock, I went 1st clean through the drop but flipped on some crazy water. I rolled up in time to find myself going backwards over another drop into a hole. I felt a firm thud as my boat connected with an underwater rock, I rolled up and quickly caught the next eddy possible. Looking up I saw Robin run the drop fine then his eyes grow as he realised how big the water was. He missed an eddy and continued on through the big pushy water and caught an eddy after the rapid. I followed down and we were soon floating to take out. A quick hitch back to the car, and then we headed back to Cromwell for some much needed replenishing. The weather reports were seeming a little unreliable, with no rain fall record & flows staying fairly similar we started questioning what Sunday's Mission should be. We decided that we'd run with our initial plan and hope that the Young would be flowing high enough come Sunday morning. 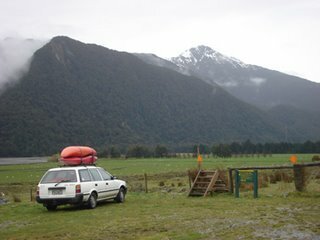 We awoke in the morning to a light rain and we decided it was worth the risk to drive over to Makarora. While eating breakfast I heard a "Hey Antz" and turned to find Troy & Chelle camping next to us. 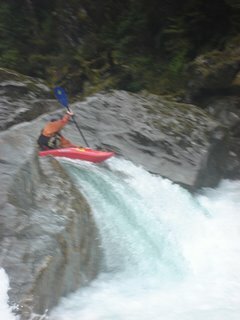 They were down from Fox Glacier and off rock-climbing for the day. 1 hour down the road and we were opposite the Young River Valley, gearing up and hoping for a good day on the water. Just after 10am we set off walking, and we were still walking about 3 hours later. The Young River is part of Mount Aspiring National Park and has a lovely walking track running up river left all the way to Young Forks. You would most likely enjoy the walk alot more if your weren't lugging a big plastic creek boat with you! The scenery was amazing though & I loved being back in beech forest. Eventually we got to the young river flats & paused for lunch. We now had 6.5 kms of class 4+ water to take us back to our car at the main road. 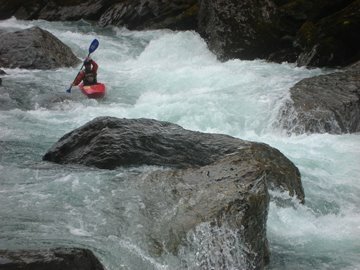 Eddy hopping down the river we found some clean read & run rapids & also some need to scout blind drops. Our 1st portage was around a 2m chute that fed into an undercut rock. Neither Robin or myself felt compelled to risk a disappearing act underwater. As we progressed the rapids started getting longer and stylier. 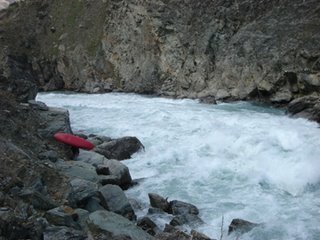 We finally arrived at the crux rapid (Prioprism) and after some scouting we both got in our boats and ran some beautiful rapids. The top of prioprism was a clean 2m fall which then wound around a few corners and lead into a big steep boulder garden. We both got held up mid rapid by one hole and but managed to eddy out behind a rock before the next big drop. 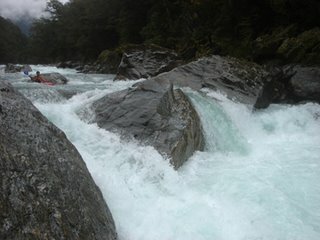 The final big drop involved cutting behind one rock, letting the current catch your nose and swing your right back into the main flow, a big stroke to pull through the hole at the bottom & then catch your breath before the next 100m of rapids. Robin went first, it looked like he was going to far right, then the last thing I saw as he dropped out of sight was the hull of his boat. Now I immediately thought that "that ain't right" so quickly paddled after him. I stayed hard against the top rock and then felt the current hit me and swing me back towards the right. I caught a glimpse of robin floating in boily pool, holding his boat. Not the nicest time to be out of your boat! Robin self-rescued and pulled his boat into a small eddy, I followed behind, Robin had spotted his paddle floating downstream and quickly rushed after it jumping from rock to rock. Once all the gear was re-united and boat emptied we were back on the water. It turns out Robin had gone hard right and the current pushed him into a small under cut. He felt his boat stop dead and got the instant feeling of "uh-oh" then what happened after that he couldn't really remember, but it all happened in a split second and then was cleaned up just as quick. The river mellowed out from their on out with a few short rapids & and then a gentle float back to the car. The paddocks were even full of new season lambs, some were still covered in blood and might have been born while we were on the water. We were just left with the 4 hour drive back to Dunedin! So that was another good weekend, Cheers Robin!